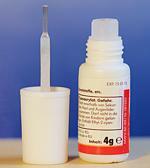 Instant adhesive with brush for head knot etc. Easy to add exactly where you want it to be. This thread, made from Dyneema, is the finest and strongest thread you can buy. It comes in white but you can easily color it with waterproof markers. Without coloring the thread will be clear when wet. Each spool holds 50 meters ( approximately 55 yards ). We sell this thread in two diameters, 6/0 (thin) and 12/0 (ultra thin). High-floating wing synthetics stuff. This consists of hollow fibers filled with air so it floats perfectly. It comes in white. The white one can easily be colored with waterproof markers. Perfect for parachute flies, Wulff flies etc. 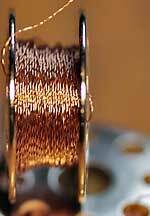 This ribbing wire is formed by two intertwining strands of shibuichi wire. Other than brass, which is an alloy of copper and zinc, shibuichi is an alloy of copper and silver. The strands have a diameter of .15 mm. I'm always happy when I find out that a product I am manufacturing solves several problems at one time. This wire is very shiny, and the intertwining strands give a lot of sparkle to your nymph. Tying it in and tying it off works perfectly, and your ribbing practically bites the body material. It won't even slip on sleek bodys formed out of body thread or the like. The spools it comes with are standard spools for sewing machines. These eyes look very nice on big nymphs or streamers. Eye diameter 3 – 5 – 7 mm. Super dubbing for fast building of nymph bodies. It is comparatively stiff and should be dubbed using a dubbing loop. Perfect especially for larger nymphs (I use it to tie most of my steelhead nymphs; it is one of my favorites). Color: gold - silver - copper - black. Diameters: 3/32 - 7/64 - 1/8 - 5/32 - 3/16. 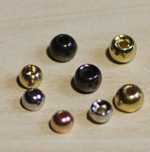 To expand our color range for tungsten beads, we add five more colors in three different sizes. The different colors as follows: white, pearl, pink, salmon and chartreuse. Each bag contains 10 beads.